This Aerangis species comes from Central Africa where it grows in evergreen forest from 400-1000m. This indicates that the species enjoys warm shaded conditions and so we grow it in Warm Asia with additional shade in the summer. 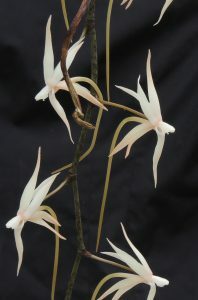 In common with most Aerangis species is this plant is pollinated by moths and has a long spur containing nectar showing a specialist relationship with long tongued Hawk Moths.